"Counting Cars" is the new hit TV show on the History Channel A spin-off from "Pawn Stars", Danny Koker's show has been renewed forat least two more car lovin' seasons. Check out the interview I conducted the night before Thanksgiving: 11/21/12. The interview was pretty much left as a transcription with only a few edits (mainly where I rambled on too long myself). 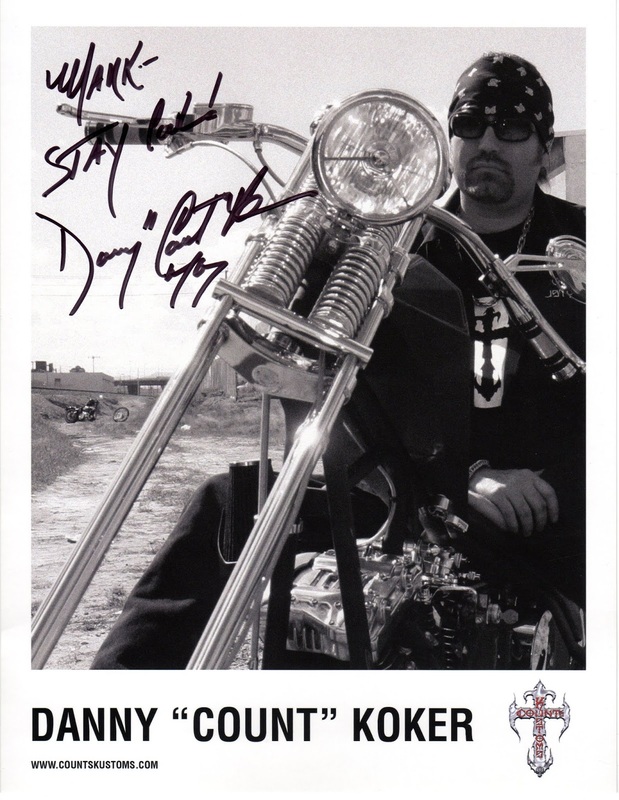 Danny was a joy to speak with and I hope to do a follow up some time down the road. 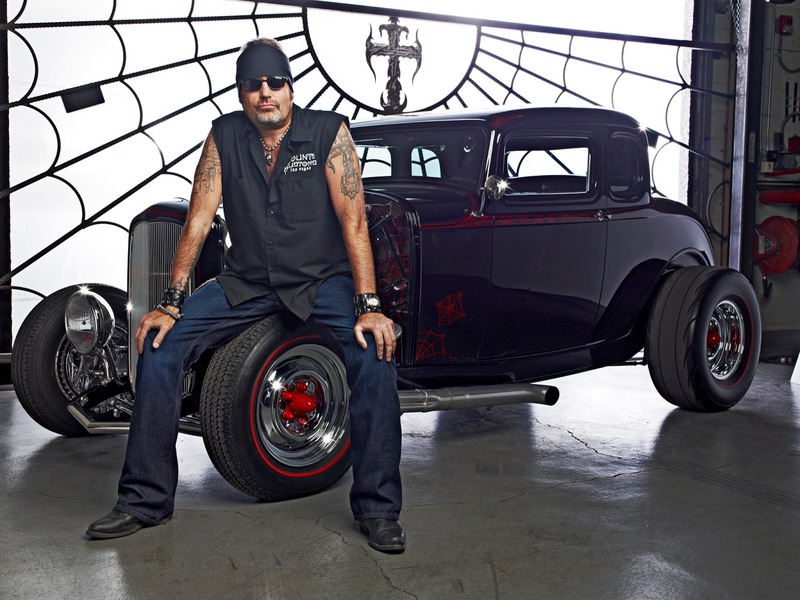 DK: Mark, Danny Koker calling from Las Vegas. How’re you doing brother? EA: I’m doing great. How are you Danny? DK: Good man. Did I catch you at the right time? EA: You absolutely did, I really appreciate you doing the interview. I really appreciate it. DK: Absolutely, that’s my pleasure, my pleasure. EA: Awesome. First thing, I was looking on Facebook the other day and you got a show going on tonight, correct? DK: Absolutely, man. My band is called Zito77 and we do all 70’s hard rock. We’re doing a little pre-Thanksgiving rock ‘n roll family party at the club tonight. It’s going to be good time. Definitely a good time. DK: Absolutely, that’s right on the money. We do Sabbath, Zep. Man, we do some old Stones. We do some Thin Lizzy. (nice) We do some Pat Travers, we do some Cream, we do some Hendrix. We do some Doors, we do…um let me think. We do some Grand Funk, we do some Rare Earth and the things we do are not your typical A-side stuff. We like the B-side stuff. We like to give people stuff they haven’t heard a thousand times. EA: That’s cool, something a little more obscure. DK: It’s a blast man. It’s a five-man band. I got two guitarists that are absolutely fantastic and of course my rhythm section, the drums and the bass are out of this world and I’m the front guy. I used to sing a hundred years ago and now I’m getting back into it and this band’s been together for about the last year and a half and it’s growing like crazy. We’re having a great time doing it. EA: That’s awesome, man. (thanks, brother) Are you doing it for fun of it and … for a year and a half and are you kinda actually trying to see where it goes. Are you trying to do some originals or. DK: We actually do a couple of originals and we’re writing some more. For us … The name of the band is Zito77. The reason for the Zito is one of my guitarists name is John Zito and I … he’s got the John Zito band and I gave him Wednesday nights to do the John Zito jam. So like he holds an open jam session on Wednesday nights and this was like I said a little over a year and half ago. I went down there on a Wednesday night and they got me to get up on stage and so I was kinda jamming with Zito and a couple of his guys. And then next thing you know different people we kinda started trading places and the five of us that are now Zito77 all kinda ended up on the same stage at the same time and we were doing a few songs together. I don’t know, it just felt really good and we were kinda looking around at each other like hmm and after we were done, we ended up out on the patio just kinda sitting around talking about music and we decided, you know what would be fun? And the five of us just kind of screw around with this and see where it goes. And so we started getting together rehearsing and it’s been amazing. We rehearse every week. Every week we add new songs to our set. …something that’s important to me and it’s a really good release for my tension and stuff. I live a pretty stressful world getting things done, but this band’s been awesome for me. So, it’s fun, but surprisingly enough it’s also doing very well. We’ve traveled around a little bit to different areas, Texas and Mississippi and different places where different bike rallys have hired us to come out and do their bike rally's. And we’re having a blast with it. So we’re going back in the studio. We’re going to write some more stuff. We’re going to start recording some stuff and see where it goes, man. It’s fun for all of us. We’re just going to see where it rides. EA: Cool. With my own music background, I literally, just this past Thursday and this past Sunday started playing out again. I’m not to the point of playing in bars and rallys and stuff, but we’re playing coffee shops and brewery and that kind of thing. (Nice) I have a 9-5 job so for me to do my music and express myself that way gives me that balance. DK: It’s good for the soul, isn’t it? EA: Absolutely, absolutely it is. EA: If I go all the way back, you started off as a singer, right? When you were a child? DK: Well, yeah. At a very young age, I used to be involved with gospel music out of Ohio. There was a gentleman by the name of Rex Humbard. I don’t know if that name rings a bell. He was a minister based out of Akron, Ohio. He was actually a pioneer in television evangelism. I know that genre got very corrupt as time went on. But he was the real deal. Rex was truly a minister for the people. He really cared about them and his ministry grew and grew and grew. And my father was his music director. My father’s background is all music. Gospel background, both Southern gospel and black gospel. Lot of quartet stuff. He worked with a lot of people way back in the day like Mahalia Jackson, Johnny Cash and his credits are pretty incredible. So he was Rex’s music director for 20 years and during that time he put together several groups throughout the years. As Rex’s family grew and as I got a little older, we all started getting involved in doing the gospel music for uncle Rex. I call him uncle Rex, was no blood but he was always my uncle. We ended up traveling the world. I lived on the road for between 2 ½ to 3 years at one time. They literally had tutors on the road. There were several of us that were still in school. I grew up doing that and then years later, ended up in Florida where I was involved in some singing down there. Since I’ve been in Vegas, I have not sang for real in 25+ years. I just got real busy taking care of business business and started jamming with these guys and it just became fun again. I’ve always loved singing, but I hadn’t done it in so long and these guys have really helped me dust off the vocal cords so to speak. In the course of the last year, year and a half, the vocals have all been coming back. And rehearsing every week is great exercise. I feel like I’m in pretty good shape vocally and we’re having a blast doing it. Yeah I do come from a musical background from a long time ago. I’ll tell you something else that we do out here on a very regular basis. Both my band Zito77 and also my club Counts Vamped - we hold charitable events twice a year out here to raise money and collect instruments for schools and kids where the music programs have been cut due to budget cuts. At least twice a year, we’ll throw a big benefit at my club and we have several bands come down and everybody does it out of the goodness of their hearts and we rocked out all night and we collect all kinds of things and we got to pass the music on to the kids, pass it on to the next generation. I understand, it’s too bad, but I understand schools having to cut budgets way the economy’s all screwed up right now, so it’s just kind of tragic that the kids are the ones getting the short end of the stick as far as the music thing is concerned, you know. They don’t get to do that much in a lot of schools. So we really support that and we really try and help the kids out with that passing it on. EA: That’s good that you do that. I really appreciate hearing that kind of thing. Makes you feel good that someone’s taking the time to recognize the fact that the schools are missing out and directly it’s affecting the kids that are missing out. DK: Gotta do it. Absolutely. The kids, that’s our future. I don’t have any kids, but that doesn’t mean that I’m not going to invest in our future. Investing some time into the kids is a positive thing. It’s a great thing man. We really believe in it. If there’s a way we can pass the music on, we try to do it. And the whole band really feels that way. I’m really fortunate with this group of guys. We’ve just become brothers. We’re together all the time. We share a lot of the same philosophies and …especially when it comes to music we just like to share. …our bass player,… when he’s not playing, he’s a teacher. He teaches bass. So he’s got a lot of young students and he’s passing that craft on to them. It’s really a cool thing. EA: Has any of his students come out to see him play? DK: It is funny because at my club I’ve got motorcycle parking out front and hotrod parking. A lot of the biking community and hotrod community comes. I rarely have any issues. But I do a show with under 21 and the kids come in and just trash it. So I don’t do that anymore. EA: Let me kinda switch a little bit. Singing back in the day. Were you born in Detroit or did I get it wrong? DK: I was born in Akron, Ohio and all my family on my father’s side are from Detroit. School time was always in Ohio, but during the summers we would all go up to Detroit. So all my summers growing up were Detroit and all my school time growing up was Ohio. I’ve got deep ties with both areas. The Akron, Cleveland area as far as Ohio is concerned was always home and always will be. But so is Detroit. I know it’s funny. I feel like I’m from two places and I’ve got deep, deep love for those of those areas. EA: So what were you like growing up. What was the young Count like? DK: A motorcycle guy. My father got me my first motorcycle when I was eight years old. Even younger than that, it was bicycles all the time all over the place. Then at age 8 he got me my first motorcycle and then it really started getting crazy from there. Really enjoyed biking a lot. When I was up in Detroit, my father’s brother, uncle Peter, he was an exec at Ford, so he had go-carts and scooters and hot rods and everything at his house all the time. We would always go over there, all the cousins and the other kids we knew in the area, we’d always go over and hang out at uncle Peter’s and play around all the time. Growing up free as a kid the things that were most important to me were motorcycles and music and as I got a little bit older, it became cars, motorcycles and music. I feel really fortunate for where I’m at right now that I get to do the 3 things that I love the most. EA: That’s awesome man. I know one of the last questions I’m gonna ask you at some point… What kind of advice would you have for someone that trying to turn their hobby/passion into their career because obviously you’ve done it. DK: In all honesty, the way that it worked for me, I don’t have any kind of secret formula, but the way that it worked for me was I had my occupation. I used to work in the television business. I was an audio guy and from there I was camera rigger, then I became an editor, technical director and edit director and to this day I still keep a couple of clients who are important to me and I still call I’m a multi-camera director live to tape or live. Calling hot shots in a multi-camera situation. The world has gone non-linear and I’m a very linear guy. So when it comes to your cameras and the editing and all that stuff anymore, I’m a fossil. I don’t do any of that. But, something that never goes out of style is being able to direct. So I still do that once in awhile for a couple of clients. I had my craft, my skill, whatever you want to call it, as far as working in the television venues, but behind the scenes never left me. Behind the scenes with the cars and the motorcycles. I treated it as a hobby, but I was very passionate about my hobby. I made sure that the time that I spent doing motorcycles and doing cars, I wasn’t just hacking stuff around it. I took a lot of pride in it. I made sure I could do it the best that I could and it got to the point where people were noticing my motorcycles and people were noticing my cars all over the place. Who did that, where’d you get that. I did that. I started collecting more vehicles throughout my life and I ended up getting my own warehouse building and adding cars down there and tools down there, certain equipment and things like that. I got another guy involved in it with me and it was kind of our hobby place. It was growing and more and more people wanted us to do more and more stuff and so we got to the point it started to look like, you know what, I think we could actually drum up some business here. It just really kind of evolved. For me, the short answer to the question is just - if you’re truly passionate about something, stick with it and do the best you can, hopefully someone’s going to take notice and if not, if nobody ever takes notice, at least it’s something that you absolutely love and you’re passionate about it should make you happy from the inside out. Don’t go into something with the intentions of making it your life’s business. For me, that would have been the wrong approach for me. For me, it was just staying passionate about the cars and the bikes. It just kinda turned out to be something that people loved and evolved in … business. I don’t know, that’s the way it worked for me. EA: Knowing your background now, since you know the behind the scenes part of how they produce shows and that kind of thing, that it’s probably a little bit of both. That you have a natural presence and natural charisma is what I think. DK: It really worked. I’ve told people that sometimes I feel like my whole life has been setting me up for what I’m doing right now. I’ve been behind the camera, working in television. I’ve been in front of people , whether it be on a stage or an event or whatever it may be. And then my entire life revolving around cars and bikes. All of a sudden it happens, this tv show. It really does work well. I’m blessed with an amazing director, cat named Jonathan White. He is unbelievable. And the crew. It’s an amazing crew. The team that works on the show. We put in some serious long hours. Several days in a row. Right now, today was my first day of not shooting in the last four weeks. It’s been every day. We start up again a week from tomorrow. We start up again. We’re right in the middle of season two and the things are going absolutely fantastic. I think season two is going to be outrageously cool. History just sent us the word down the other day, that as soon as we’re done with season two, they just want us to roll into season three. Right now, we’re filming til April. That’s my schedule, from now until April, I’m filming. No complaints, man, best thing in the world. EA: I was going to say, congratulations. The fact they want second and third season back to back says a lot. DK: It’s a lot of work don’t anybody fool you, but I’m also not tarring roofs in 115 degree temperature, so I’m thankful for that. I’m doing what I love to do and I’m able to pay the bills. There’re long hours and they’re a lot of work, but you know, man, it sure beats the alternative so I’m cool with that. EA: It’s all about perspective. I read somewhere, when I was trying to do some research on you, that when you came to Vegas, you were on a tv show, that you were hosting like a horror Saturday night thing. Is that right? DK: Absolutely, absolutely. When I lived in FL, I used to do a lot of live theater down there, so I’ve got a little bit of an acting background . Coming out here to Vegas was when I was really active in television business and the tv station was an independent station so we had no news. So we had no personalities. We had no actual personalities that represent the station. In this market, there’s a lot of places to make personal appearances that’s good for business. The other stations, they get their news people that they can send out and shake hands and all that kind of stuff. I’m also, from the bigger cities of Cleveland and Detroit, and growing up as a kid I always watched the horror host, I’m a huge horror movie fan. I always watched that stuff growing up, so everybody at the station decided it would be awesome to do a late night, old school, horror movie show, a hosted horror show. I pretty much got elected into doing it . So we created a character, a vampire who loved Elvis in Las Vegas. And his name was Count Cool Rider and Elvis’ theme song is CC Rider, so his character was Count Cool Rider. He’s kind of a biker/hotrod/Elvis-loving vampire in Vegas…We worked Saturday nights from 10 til midnight, every Saturday. It was called Saturday Fright at the movies. That show ran for 10 years. From 1990-2000. And 52 weeks a year, we were trying to keep things current, so we were doing about 45…a year. That’s a whole lot of work for 10 years straight. Man, talk about a huge following here in the Vegas market. A couple people tried to syndicate it, but the films in the other markets iss where the problems came in. So it’s basically stayed here on the local level . Althought the show’s pirated in other areas. I get letters from PA and people like that, were are recording and sending it back there was kinda cool. That’s where the whole “count” comes from and behind the scenes, the cars and the bikes, that hobby which has just grown and grown and grown. When I signed off the air Saturday Fright at the Movies off the air in 2000, that’s when I basically focused my efforts into creating Counts Kustoms and that’s how that came about. My guys that work with me down there and friends that I’ve known that work with me for awhile,…what do we call this place. It was kind of unanimous because everybody here in Vegas knew who the count was. So we’ll just call it Count’s Kustoms. Who knew that the shop was going to blow up to be the national, international thing. Count’s Kustoms came to happen and the whole motorcycle craze got big. I was featured on several shows that were on the Discovery Channel at one time or another. My bikes have been in just about every magazine that publishes that. I’ve got a rig and a crew of guys that we were on the road doing bike shows all over the place. It was very big there for awhile. Count’s Kustoms was big in the bike world for awhile then the economy tanked and I pulled everything back and just focused in the shop on mainly doing repairs and automotive repairs and things like that . Just pay the bills. Keep everybody happy. Keep everything going. Along came Rick Harrison and my whole world was changed. EA: Wow, what a whirlwind. DK: Absolutely crazy, it’s a madhouse man. I show up at my shop now and there are hundreds of people in my parking lot and they just want to come in and they want to see the shop and they want to say “hi” and I do my best to try to shake hands with everybody and take pictures with everybody and still try to get work done. It’s mindblowing how this just happens and the nicest people that I’ve met through this show. The fans that watch. They’re from all over the world they come down and they’re just some of the nicest people you’d ever want to meet. I come home at the end of the day everyday and it’s like “wow” what just happened today. Everyday is like “wow”. I’m a fortunate guy. I assure you this, man, I’m the kind of guy that gives back in every way I can. Like I was talking earlier about the music programs for the kids. And I’m a huge supporter of our troops. We do benefits for our troops. My band, we do things for the Marines all the time. We do fundraisers at their leatherneck club. And they always have Zito77 so we come down there and we do that for them and help them raise money for that. We do charitable things like for the Wounded Warrior projects, things like that. Doing everything we can to try to give back as much as we can because you know. I feel so lucky that things are being given unto me, I want to give back as much as I can. EA: That is just awesome to hear and I can tell that you’re sincere by the tone of your voice. DK: You gotta be. You gotta do this. I go back to my upbringing, but…If it’s coming from upstairs, then I gotta give back and I feel like the more I give back, the more he continues to bless…It’s more than a philosophy for me, it’s a way of life. EA: Right, that’s awesome. I’ve talked with some people around here locally that whole concept that freedom’s not free. They’re supporter of the troops as well everything that they do that allows me to do what I do. DK: Amen. I do my best, man, I really do. And you know, I respect people’s different opinions. A lot of people are saying, we shouldn’t be in any war. We gotta bring the troops back, this and that. It’s always a two-sided argument. I’m one that’s very strong about national security. I fall on the conservative side… Whether you agree with the war that we’re involved in or disagree with the war that we’re involved in, the bottom line is this. Our troops are laying their lives on the line for our freedom. So whether you agree with it or not, one thing you can’t deny, those troops are over there for us and for our freedom. So you have to support the troops. EA: Since you’re a big horror fan film buff. What are some of your favorite horror films? DK: Anything from Nosferatu 1923, starring Max Shrek silent movie, that was awesome. Bela Lugosi, I believe it was 1934, Dracula, he was fantastic. I’m huge on Anne Rice’s Interview with the Vampire. I thought that movie was very, very well done. I think Bram Stoker’s Dracula starring Gary Oldman was a masterpiece. I’m also a huge fan of Vincent Price movies. Peter Lorre, Vincent Price then you go back to the Christopher Lee days. Those are the things I grew up on as a kid, so I think about Vincent Price and Peter Lorre, Christopher Lee and Peter Cushing all those guys. That’s the stuff I grew up watching. There’s a real nostalgic side of me that loves a lot of the old horror. I just love it so much. And there’s some new stuff, well I call it new stuff. Interview with the Vampire, that’s new even though that was 16, 18 years ago I’m guessing. And then Bram Stoker’s Dracula which was an absolute masterpiece. I like things like the SAW movies. They make you bite your fingernails off and just try to make it through the movie. I’m into all of it, but those are some of my favorites. I think The Shining was a masterpiece. The Shining, Stanley Kubrick was way cutting edge on that. That show really pioneered the use of stage and when you go into that snow maze scene. There’s no tracks, there’s no nothing. That shot was just seamlessly smooth. That was all fake and phenomenol movie right there. As far as modern horror is concerned, someone that I absolutely love I think is a genius in several ways is I’m a big Rob Zombie guy. I absolutely love his music. I’ve seen him live several times. It’s phenomenal. I love his art. He’s quite an artist. He’s got some really great stuff there, but as a director in his horror films, House of a Thousand Corpses is a masterpiece in my book. Devil’s Rejects, and …again was another masterpiece in my book. I love his interpretation of the original Halloween. I don’t even call it a remake, because it wasn’t a remake. It was more his interpretation of Halloween. And it was so raw and edgy and dirty. I thought it was a masterpiece. I love Rob Zombie. I think he’s great. Met him one time.I think he’s way cool. EA: That’s cool. It’s funny that you mention Rob Zombie because Dee Wallace was asked the question who was her favorite director that she’s ever worked with and she had just finished filming his upcoming Lords of Salem and she had to sit there and think about it for awhile because she’s worked with Spielberg, Blake Edwards, Peter Jackson and “ if I had to speak truthful right now, it would be Rob Zombie”. DK: Everybody says amazing things about him. Cassandra Peterson, Elvira, she’s a friend of mine and she’s so cool, we got to talking one night about Rob cause she knows Rob. And she just went on and on about what a nice person him and Sherry and how generous they are and how kind they are. And their home is beautiful and they open their home up to friends and have people over. That they’re just these sweet, kind, generous people. It’s just so funny cause you look at him and you think oh geez. He just turns out to be a really genuine nice guy. EA: One last thing I want to ask you. So what do you have coming up in the future? Besides the second and third season you’ll be filming through April? DK: That’s a really good question. 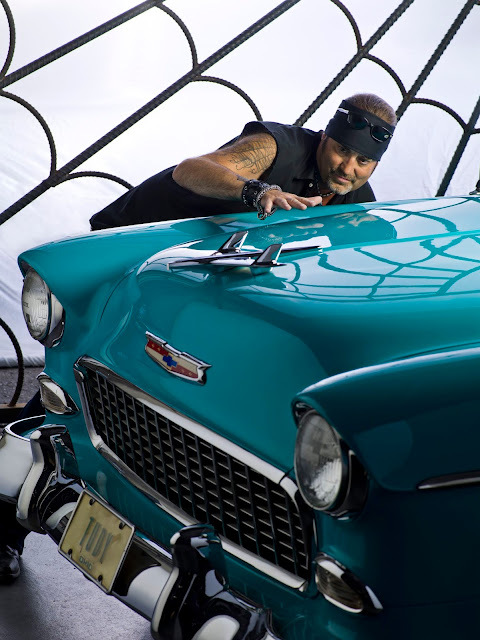 Right now I’m 100 percent focused on these next 2 seasons of Counting Cars. That’s my number one priority because it has boosted everything in my world. It has boosted all of my businesses I’m involved in, it’s boosted the band and the music that I’m getting the opportunity to do. So that’s my number one focus, but I know the band has some out of town bookings coming up. We’re going to focus on writing some more original music and maybe putting out a record. Other than that man, cars and bikes. I’m just focused on cars and bikes and I’m lovin’ every minute of it. EA: Awesome. Thank you again Danny for doing the interview. I really appreciate it. This is a real treat for me. DK: Mark, the pleasure’s all mine. It’s really great to meet you and call on me anytime. You want me to do anything ever again, just holler. I’m easy brother. EA: I’ll let you know. Have a great gig and Happy Thanksgiving tomorrow. DK: Thank you Mark. Happy Thanksgiving to you and all the holidays coming up. Hope it’s safe and fun.